spiral in clockwise: 1. in front of Muzium Istana (i guess so) 2. in Hotel Orkid, where we have our nap 3. the famous A Famosa 4. i seriously dont know what is this old wall/fort called 5. Stadhyus 6. St Paul Church, stepping on a tomb 7. Muzium Samudera 8. 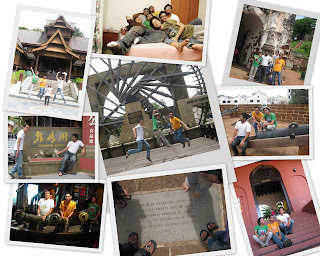 Jonker Street 8. Kincir Air Replica. but sure hell Melaka have changed. new roads, new buildings and new attractions...we really have a great weekend! this was our quick itinerary! 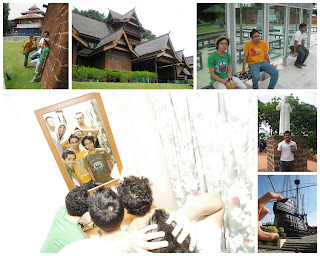 3.00a.m: Searched for hotel (ronda-ronda malam too) and settle for Hotel Orkid. 2.45p.m: Head back to Ayer Keroh Heights and bought refreshing Air Tebu..slruup!! 3.00p.m: Exit Ayer Keroh and head to KL! We were bloody tired but it was an Awesome Outing. On the 28th of March, the proud Malaysian has answered the call to act for our beloved mother earth. 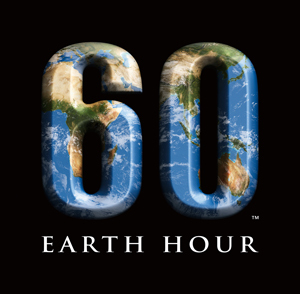 It was called the Earth Hour, a campaign that was planned and ran by WWF Malaysia together with their collaborators. It's simple to participate in the campaign; just switch the lights off for an hour between 8.30 to 9.30 pm on the 28th of March 2009. I wasn't at home during the campaign (but nizam took the initiative to support the cause too) as we (me, sheh and golek) rolled out to KLCC to see our national icon switching off it's gerzillion lights, and it was a spectacular view. We lepak at the park, and getting there we could see dozens of lenses have been stationed throught Ampang at strategic places to record the memorable event. A minute past 8.30, phase by phase KLCC lights were switched of (excepts the beacons, for safety reason i reckon). When the KLCC was in dark, there were roars of cheers by the onlookers that were waiting by the fountain. But funny thing was, it was abruptly killed by Isya's azan that was suddenly on air (hehe) and minutes later we could see almost an empty sky if not the hotel rooms where the guests felt that their pockets have been ripped for the night stay, so they must maximize the usage and bill on the hotel. We have our dinner at Signature, almost all cafes and restaurant within KLCC were lit with candles and it was a pleasant sight. Finishing our dinner,we took our seat near to the fountain, to watch the towers to be lit again. Well, the process was slow because all the big lights took quite sometime to start again, but anyway i would say congratulations MALAYSIA for taking the big step to promote and act upon Global Warming. Well, there is a loser that night, take a guess...yup, it was TNB. 550 mw of electricity was saved (unspent) during the hour and it was equivalent to 14 millions 40 watt electric bulbs unlit. I dont want to touch on that part, i dont think it will affect Malaysian economy in a big magnitude. In the end, i would like to remind myself and everyone that Global Warming is not unevitable. We have what it takes to stop the earth from aging and all we have to do is to do things by ourselves, and keeps reminding others to do so. Well, im no Captain Planet, but i believe to make a better place is not a Utopia. Aku tau macam ada x kene bile aku tulis Juliet of Orange, tapi malas nak check, bile fikir balik, aku salah pasal terpengaruh dengan William of Orange, tue yang terkonpius tue. Sape William of Orange? bukak balik buku sejarah. X payah bitau, kitorg mmg tido berpelukan! Tetiba, sesuatu menyambar (struck) minda aku, ade ke org baca blog aku nih? Bile aku cek balik, mmg x berpaedah pon bende alah yang aku tulis,Update pon kurang, gamba pon tade...nulis je, bapak bosannye ....rasa x signifikan. Macam sesumpah menyorok dicelah dedaun..ade, besar, leh nampak, tp x nampak pon tape! Tapi, kat mana aku nak melampiaskan kegeraman dan kebencian yang dibakar oleh nafsu amarah yang bakal muncul tiba? All work and no play makes napie a dull bloke!